As a company, you are always on your toes to try and update your products, services, knowledge and skills. The competition out there is tough. Everyone seems to be at the top of their game. Yet, what is it that will make you stand out from the rest? Why would customers choose your company over other companies offering the same products and services? This is where Good Customer Service comes into play. Good customer service is what sets you apart from the competition. Many might argue that quality products and services are enough to hook your customer on for life. But how will you market or sell these high quality products without good sales representatives? Hence, it is of utmost importance for your company to hire a sales representative who has the talents, knowledge and skills of your products and services. Not only that, you must ensure that he is able to deal with customers appropriately. While hiring a sales representative, how can you make sure you are choosing someone who has the right temperament, patience and empathy to deal with your potential customers? Read on, to find out how you can thoroughly asses their customer service skills during an interview. 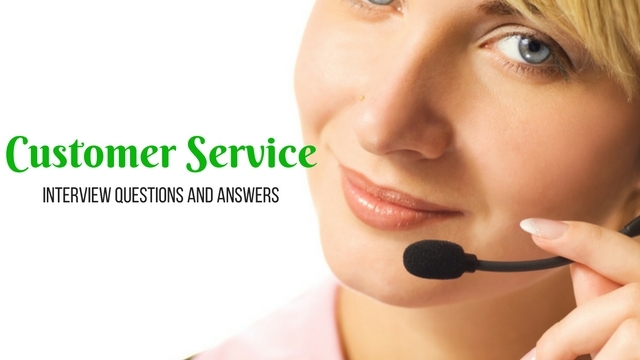 What is the Job of a Customer Service Representative? A customer service representative is an employee of your company who interacts directly with customers. They are incharge of handling customers’ orders, customer complaints, and process returns. In short, a customer service representative is a direct representation of your company. He is the face of the company who the customers interact with. This is why it is important to choose the right person for this job, as he will be responsible for the positive or negative feedbacks customers have towards your company. The right customer service representative should have complete knowledge about your company, the products and services you offer, and an indepth knowledge on how these products and services work. While this is a skill which can be taught, the more important skills which cannot be taught are passion, patience, humility and having a good personality. When choosing a good customer sales representative you must make sure that they have a passion for helping others. This value will come in handy when they will be representing your company, and will have to deal with particularly ‘difficult customers’ day in and day out. This is a good question to start off with, as it will give them a chance to explain to you what their interests are and why they are particularly interested in working in this field. It is common knowledge that a job of a customer service representative is not an easy job. While some days might be good where sales are smooth and customers are friendly, they will also have to deal with bad days when they will not have any sales, and deal with rude, arrogant or ignorant customers. Here is the true test of a good customer service representative. He must hold his ground, never lose patience, and deal with customers in a positive manner. Any harshness from the representative’s side will directly have a negative impact on your company. 2. What first drew you to work in customer service? The applicants response to this question will help you asses why they have chosen this line of work. Whether they want this job just to make some extra money, or they are truly passionate about customer service and enjoy helping people, is the thin line between what makes a good or a bad customer service representative. 3. Give me an instance where you had to deal with a particularly difficult customer? They say a person’s past behaviour is the best way to predict their future performance. By answering how they have previously dealt with difficulty at the workplace, you will get a fair idea on how they would deal with problems at the current workplace as well. 4. What does excellent customer service mean to you? This can be a double handed question. On one hand, the applicant’s response to this question can be a direct quotation they have memorized, and this will not really help you get an insight on what they feel. On the other hand, if they answer the question in their own manner, it will help you find out what their values and philosophies are. 5. Share a story about a time when you faced a problem whose solution you did not know immediately. How did you resolve the issue? How did you deal with the customer? Ask your candidate to give you as detailed account about his experience. Most companies have a basic protocol to deal with problems and difficulties faced at work or with customers, and they train their employees thoroughly on how to resolve these issues. Even so, sometimes situations may occur which have not been planned beforehand, and how the candidate has been able to resolve the issue using his own mind will provide you great insight on how temperamental he is, as well as his quick thinking abilities. 6. Describe a situation where you and your team did not get along well. What was the role that you took on? What was the end result of this? Were you able to finally manage as a team? This is an excellent question to determine the teamwork skills of your candidate. We do not always get to work with the people of our choice. While this can be a very big disadvantage, in a professional working environment it is necessary for us to exhibit extreme professionalism. When your candidate was faced with a difficulty in working with his team mates, what role he took- whether it was a leadership role or whether he decided to sit back and let everyone help themselves, will help you determine his ability to work with others. 7. Tell me about a time when you had to take on multiple tasks at the same time. How did you manage to complete these tasks? Almost every job that you will apply for will require you to multitask. While some people are naturally good at multitasking, others might find it slightly tougher to do so. This question will help you assess how well your candidate can multitask, as in a customer service industry, it is essential to be able to multitask; they are required to woo customers, engage them in conversation, be polite, informative, solve as many queries as they have, as well as reach the target of making a sales. Multitasking skills are a must in this field. 8. Do you prioritize tasks and projects when scheduling your time? Give me an example of when you have done this. Time management is another skill that is a must in any field of work. This skill is even more important in customer service as you are faced with target and heavy pressure and work load, and how you are able to handle the pressure and manage your time is essential. 9. Elucidate an incident when you had to work with someone who you had difficulty in getting along with. How/Why did you find this person difficult to get along with? How were you able to handle this incident? As the name suggests, in a customer service job, having good interpersonal skills is one of the most important attributes a candidate should possess. In this question, you will be able to assess levels of patience and perseverance of your candidate. What exactly is a ‘difficult customer’ varies from person to person. Hence, this is a good opportunity for you to find out how good the interpersonal skills of your candidate are. How they are able to deal with this ‘difficult customer’ will also give you an insight on the candidate’s personality. 10. Which software applications are you proficient in? While customer service mainly deals with customers directly, and solving their issues, software knowledge is also an integral part of customer service. Customer service representative deals not only with the customers, but also with orders, returns, exchanges, problems in regards to products and services, and how to resolve them. For this, the candidate is required to be proficient in computers and various software. 11. How many orders/ queries did you deal with on an average per day? This question will allow you to determine how much workload your candidate has been used to, as well as how much workload he will be able to take in the future. As you will have to deal with targets in this industry, you want to look for a competent candidate who will be able to carry on the workload efficiently. 12. Tell me about a time you have had to adjust to a new manager who had a different management style to what you were used to. Here is another classic example of adaptability to change. As a customer service representative, the candidate’s job is flexible and dynamic. The candidate applying for this job must also showcase qualities of being ready to accept changes. If they show resistance to change, it could turn out to be problematic for the company in the future. 13. Was there ever any instance when you were unable to help a customer? How were you able to deal with the situation? There is never a 100% success rate at any job. While a company may strive to get this, it is rarely seen. Your candidate may have failed to help customers previously. This question will help you find out what their weak points are, how they dealt with it, and if they will be able to deal with the same problem successfully in the future or not. 14. Have you undergone anything recently which would help you become a better customer service representative? Skills and knowledge have to be updated always. There are new discoveries, inventions and technologies being made every single day. When working at any job, it is important for an employee to always brush up their skills and knowledge. If a candidate is genuinely interested in the job, they will make sure they are updated. A person is familiar with his own strengths and weaknesses better than anyone else. The right customer service representative is one who is always ready to learn and improve himself so that he is better suited for the job than others. 15. How have you helped your previous company to increase revenues, reduce costs or save time? A genuine employee of a company works not only for his own benefit, but also for the benefit of the company. Simply achieving sales targets and making customers happy does not entail a customer service job. This question is going to make it clear to you whether your candidate was genuinely interested and cared for the company he worked with or not. Working from the mind and working from the heart will always yield different results. 16. What are your strengths and weaknesses when interacting with customers? When interacting with your candidate, your experience will help you determine what strengths and weaknesses your candidate has. But this is not enough. It is important to hear what the candidate thinks about his own strengths and weaknesses. It is human nature to want to showcase your strengths and hide your weaknesses. If a candidate is well aware of his weaknesses and is not shy to admit it, rather is wanting to work on them and improve them, this is a green signal for you that the candidate is mature and ready for changes. 17. What do you know about this company’s products and services? A candidate must always come fully prepared to an interview, no matter how many interviews they are doing in a day. If a candidate comes without doing proper research on the company he is interviewing at, it shows lack of interest and genuine want to work with that particular company. These interview questions should help you assess the strength of your candidate in customer service.